Here are my tips for visiting Grand Canyon National Park, and our top 10 things to do at the Grand Canyon. This post specifically covers the South Rim of the Grand Canyon, which is where over 90% of visitors to Grand Canyon National Park go. (The South Rim is the side closer to Phoenix, Arizona and the North Rim is the side closer to Las Vegas, Nevada). A lot of visitors spend a day or less at the Grand Canyon, driving their car to one spot on the rim, getting out, taking some photos, and calling it a day. This is such a mistake, and there’s so much to see at Grand Canyon National Park that they’re missing by doing this. Most visitors could spend at least two days at the Grand Canyon, with the sky being the upper limit for those who want to do serious hiking, mule rides, or whitewater rafting. Sadly, less than 1% of Grand Canyon National Park visitors venture below the rim (according to a ranger with whom I spoke at the park, approximately .1% do the mule rides or whitewater rafting, which is believable, but I can’t find any documentation to support this), which is arguably the coolest part of the Grand Canyon experience. To combat the normal way people visit Grand Canyon National Park, I’m expanding this list from the normal “top 5” nature of our National Park lists to 10 items. This guide covers simple touristy sightseeing, as well as hiking, wildlife watching, and other options. I always recommend a couple books about the places we visit since I love books and read a lot, myself, when trip planning, but in this case, only one recommendation is necessary: Grand Canyon The Complete Guide. It’s full color, current, and thorough. The photos in it are actually better than the photos in the Photographer’s Guide to the Grand Canyon and Northern Arizona that I also purchased. (For what it’s worth, the photographer’s guide is good, but probably most useful for finding good nearby locations besides the Grand Canyon). Virtually everything you read will suggest sunrise at Mather Point. There’s nothing wrong with this advice, as Mather Point offers a great, sweeping view of the Grand Canyon. In fact, I’d second this advice if you’re going in the late fall through early spring. I loved the view Mather Point so much that I shot two sunrises from there! However, since Mather Point is the largest viewing area in the park and the spot everyone recommends for sunrise, it is packed. This was true even when we were at the Grand Canyon in February, so I can only imagine how bad it is in the middle of summer travel season (the size of the parking lot gave me a pretty good idea!). 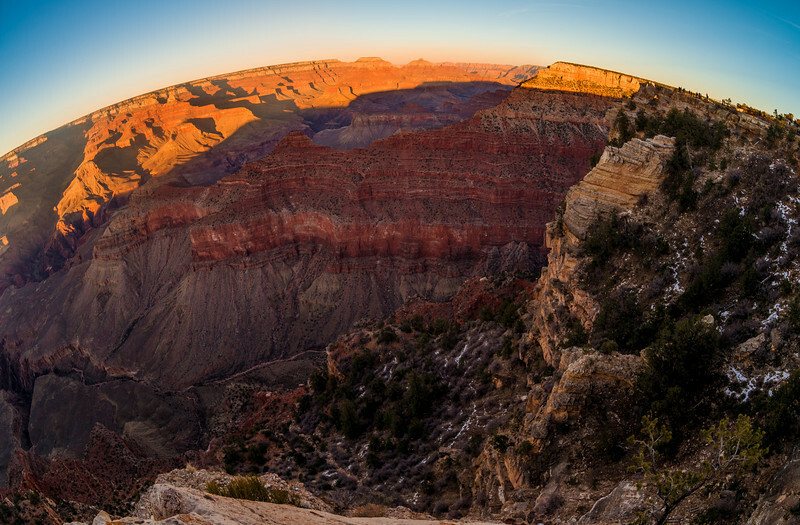 By contrast, I was all alone for the sunrise at Yaki Point, with just as good of a view. Because the parking area is much smaller at Yaki Point, it’s restricted to only buses (and those with accessibility passes) during the summer. This winter, it was also limited to only buses, so perhaps going forward it’ll be ‘bus-only’ year round. There is reliable bus service from the Grand Canyon Village, so getting there is still very easy. 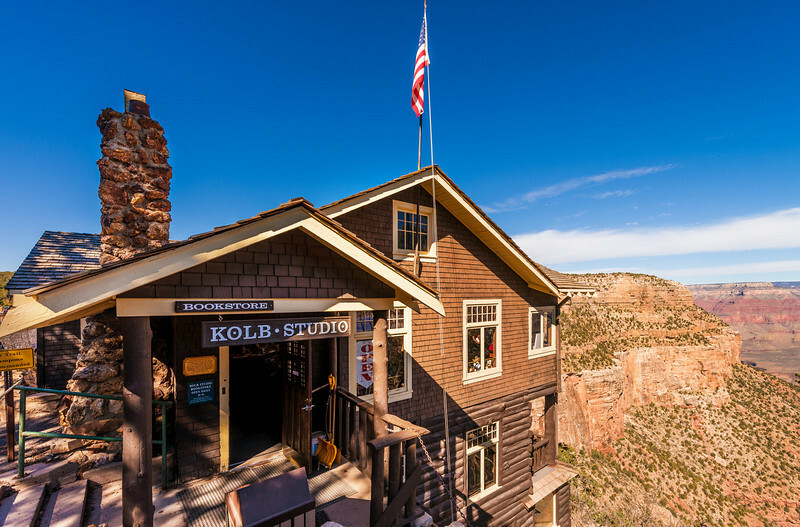 Kolb Studio is the former home of “The Amazing Kolb Brothers,” who were photography pioneers and daredevils in the Grand Canyon. Their studio features an exhibit that showcases their tenacity as photographers seeking to do things that have never been done before, which is quite inspiring as a photographer. It’s not that their work itself is all that captivating, it’s how they put it all out there to get the shot. It really is a small miracle that Emery lived until 1976! I’m not sure what runs after the current exhibit, but since it’s Kolb Studio, I assume it’ll be something along the same lines as the current exhibit. On the other side, the studio showcases a ‘human interest story’ of two brothers (and subsequently, their families) who were early settlers in the Grand Canyon, and their travails as they struggled to run a viable business. It also gets into some of the disputes between the brothers, but it’s unclear as to whether there was actual bad blood between the two sides of the family, or if it was just a business falling out, with the two brothers remaining on good terms (I’ve heard both). Plan on spending at least 30 minutes at Kolb Studio. Ideally, this would be “Mule Rides on Bright Angel Trail.” Unfortunately, we did not do the mule ride. I visited Grand Canyon National Park with my father, and he was prohibited from doing the mule ride. However, he’s stubborn as a mule, so we hiked the trail on foot instead. Bright Angel Trail goes all the way down into the Grand Canyon, eventually taking you to the Colorado River and Phantom Ranch, if you hike all day (or longer). Going down, Bright Angel Trail is an incredibly easy hike. Presumably because you have a lot of novice hikers on the trail, there are a lot of signs that essentially say, “hey stupid, just because the way down is easy doesn’t mean the way up is!” and cautioning hikers that they shouldn’t do the entire hike in a single day. We didn’t do the full trail down to Phantom Ranch, but we did a good portion of it, and found it to be a beautiful hike. Seriously, if you’re going to Grand Canyon National Park, at least do the first leg of this hike. It’s only a few miles roundtrip, and is relatively easy even factoring in the return ascent. The Grand Canyon takes on a totally different dynamic once you’re below the rim, and you get a completely different sense of scale. Once you can look both down and up to see the Canyon, you truly get a sense of how vast it is…and how minuscule you are! Obviously, if you dine at El Tovar Dining Room, you’re also visiting the historic El Tovar Hotel (we highly recommend staying there), so this is killing two birds with one stone. El Tovar Dining Room offers excellent fine dining in a setting overlooking the South Rim. Need I say more? Okay, in addition to it being great fine dining in a great setting, it’s also fairly priced in terms of fine dining. Given the location and view, I went in expecting inflated prices. They’re not at all. To be sure, it’s not a cheap meal, but it’s not overpriced. If it is too expensive or you just don’t want to do dinner, try breakfast instead. For dinner, I recommend the Buffalo Filet Mignon. For breakfast, try the El Tovar All Natural Black Angus Prime Rib Hash…and save room for the fresh-baked cream horn pastry! Much like Mather Point for sunrise, everyone talks up Hopi Point for sunset. Accordingly, it was packed with people by mid-afternoon in February. I can only imagine how bad the scene is during summer vacation season. Seeing this, I began scouting other spots to look for decent alternatives. What I discovered was that the next large stop after Hopi Point–Mohave Point–was actually superior to Hopi Point! Now, superiority is a subjective matter. Especially when it comes to Grand Canyon viewing locations, as many of them are substantially similar (they’re all overlooking a big canyon!). My basis for saying that Mohave Point is superior is from a photography standpoint. If you’re set up in the correct spot (the small overlook that’s only large enough for a 3-4 people on the far left), you are able to photograph the canyon as it’s illuminated by the late afternoon sun, and you can also shoot back into the sun as it sets behind the canyon in the other direction. 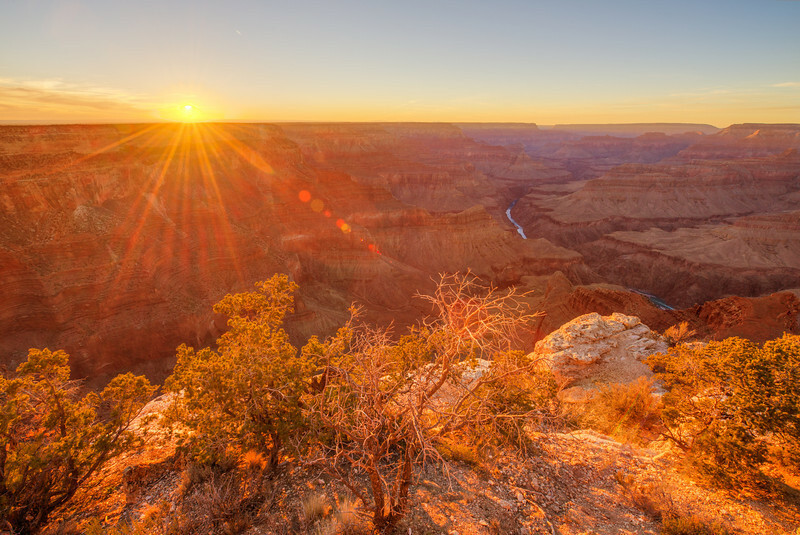 Photographing the Grand Canyon with this sun-kissed glow at sunset is possible from just about any viewing spot. For some reason, this is the default way of photographing landscapes (not just the Grand Canyon), and while it provides pretty results, it’s so ordinary. Shooting into the sun is much more interesting, dynamic, and challenging. Based on what I observed, Mohave Point was the best spot for shooting into the sun during the sunset with part of the Canyon in the frame (obviously the location of the sun in relation to the canyon changes depending upon the time of year, but this is typically true). Even if you’re just going for the pretty view, and not photos, I’d stay away from Hopi Point. That is, unless an integral part of experiencing one of the most beautiful sights nature has to offer involves doing so with hordes of people around. Mary Colter is the architect and designer behind many buildings at Grand Canyon National Park, but my favorite is Desert View Watchtower. It reminds me of a watchtower that might’ve been built by pirates at the edge of the water, except it was built by a modern architect at the edge of a waterless (well, besides the Colorado River) canyon. Desert View Watchtower is a bit of a drive from Mather Point, being about 45 minutes away with limited other draws along the way, but it is so worth it. 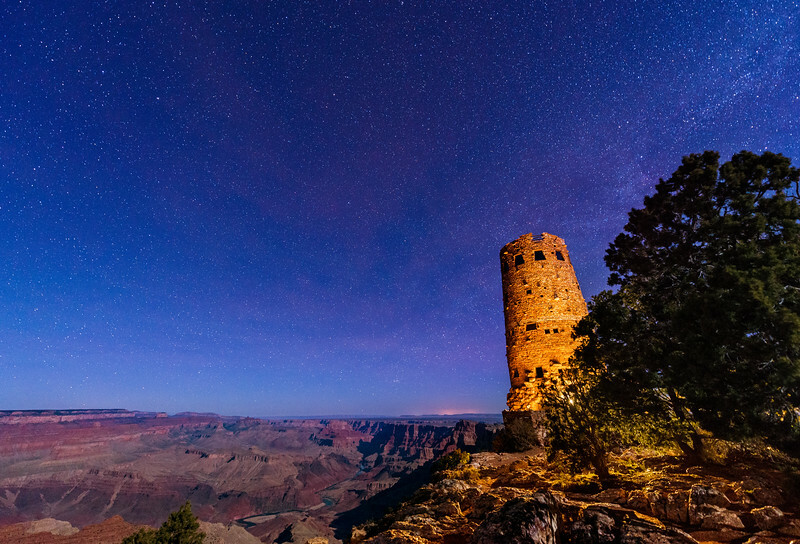 From the cool exterior of the Watchtower itself to the art inside to the view of the Colorado River and far side of the Grand Canyon below. Even the twisted trees here are photogenic. Yes, it will take about 30 minutes to get to from Mather Point, but it’s well worth the trip. We liked Desert View Watchtower so much that we made three separate trips out to it! Hermit’s Rest is on the opposite end of the South Rim from Desert View (although you won’t be traveling directly from one to the other, they’re over an hour apart, to give you an idea of distance). 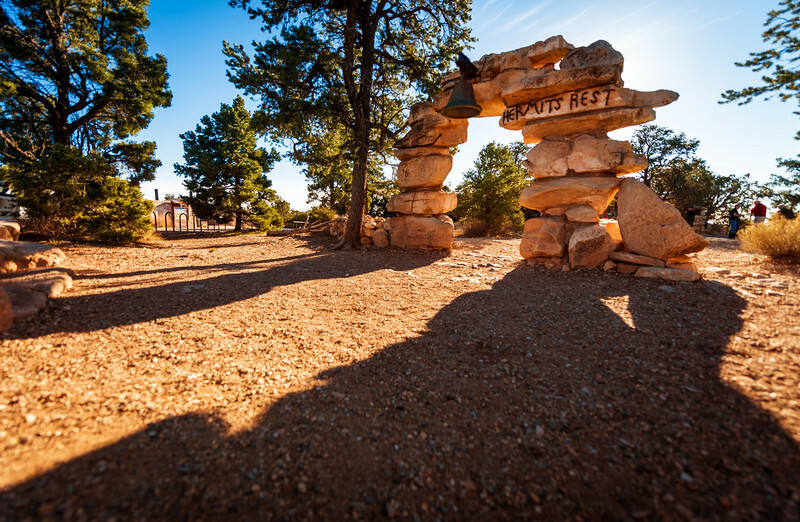 Hermit’s Rest was originally built as a rest stop for tourists on coaches operated by the Fred Harvey Company on the way to the now-vanished Hermit Camp below the rim (which was effectively replaced by Phantom Ranch and development above the rim). The building is a Mary Colter design, and was created to appear to be a natural stone formation rising out of the land. The design of the building and its National Historic Landmark status make it worth a visit, but what I find most interesting about this place is the history of its opportunistic origins. Even in the 1800s, the Grand Canyon was a bit of a tourist draw, just for a different kind of tourists. It’s fascinating to see how it evolved from a makeshift tent camp to a sprawling village of shops and hotels today. Out of all of the National Parks I’ve visited, Grand Canyon National Park has, by far, the most gift shops. This makes some sense, as it’s probably the most touristy National Park. Many of the spots that are exhibits or historical buildings double as gift shops. Most of these have been left off the list, but Hopi House is an exception. While it is highly commercialized, most of what’s inside was crafted by Native Americans, and is quite stunning. (There are also some cool retro Grand Canyon National Park posters that I didn’t see elsewhere, although I didn’t make a point of checking out every gift shop.) This shop is unique as compared to the other gift shops, and if you want something handcrafted from the region’s native peoples, Hopi House is the perfect place to stop. Wildlife may not be the first thing that comes to mind when you think of the Grand Canyon, but actually, there are a lot of animals in and around the canyon. 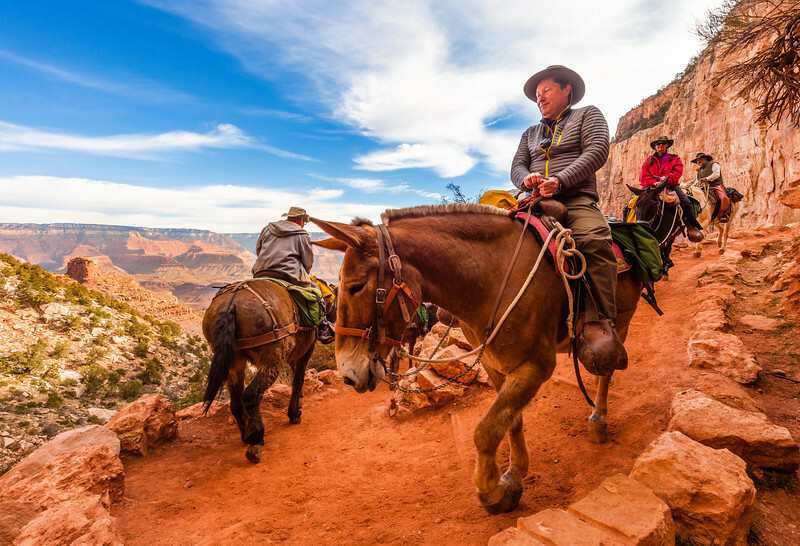 Mules carrying homo sapiens are the two most common species found in the park, and they can regularly be spotted traveling through the park and into the Canyon. Just kidding about the mules and people (well, I’m not kidding about them being common, but you know what I mean…). Besides mules and people, there are actually a lot of animals. During our visit, we saw deer, elk, wild horses, and other small ground-dwelling animals. 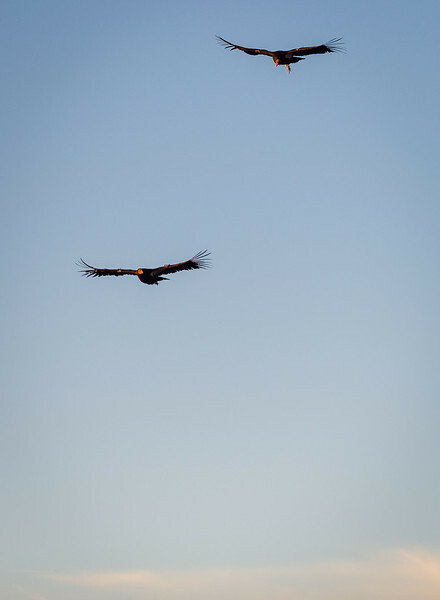 By far the highlight was having two California Condor swoop overhead as we waited for the sunset at Mohave Point. My understanding is that California Condor and mountain lions are in the park, but aren’t too common to see. 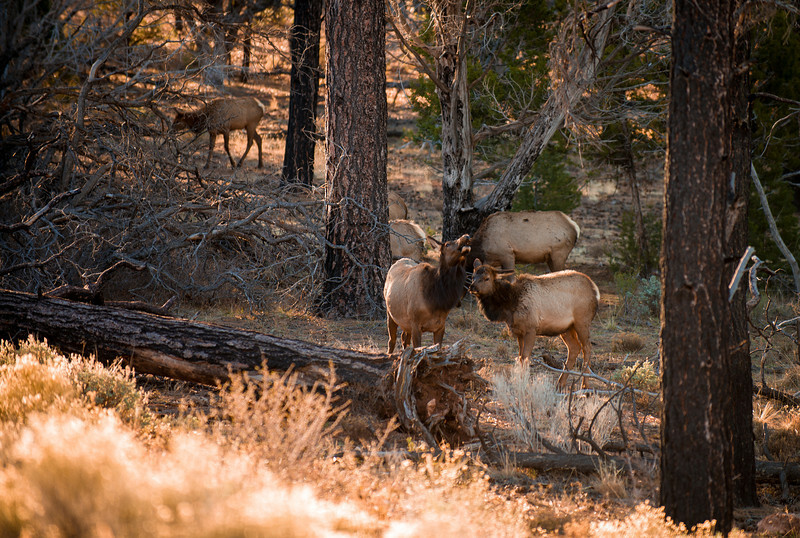 Elk are pretty easy to find–if all else fails with regard to seeing them, head out towards Desert View Watchtower in the early morning and you’re bound to see some alongside the road. The final entry on this list was sort of a toss-up between Tusayan Museum and Yavapai Geology Museum. Although I prefer the displays in Yavapai Geology Museum because they give context to the Grand Canyon and its formation, Tusayan earns the last spot because it’s a museum plus has actual ruins of Pueblo Indian housing in a loop outside the building. Tusayan Museum offers a glimpse into Pueblo Indian life at Grand Canyon approximately 800 years ago. Displays include pottery, arrowheads, and other household artifacts, plus split-twig figures and other structural displays. It’s a quick stop on the way back from Desert View Watchtower, so check it out. Even with this expanded, 10 item list, there’s still a lot to do in Grand Canyon National Park. This doesn’t even cover the North Rim (nor the increasingly popular West Rim), and I know I’d love to do a mule ride, raft down the Colorado River, and do an overnight stay at Phantom Ranch. Besides these things, there are a lot of trails, Bright Angel Lodge, the Grand Canyon Railroad, plus other things to do in Grand Canyon National Park beyond just what we have listed here! These photos of Grand Canyon National Park were all taken by me with my my Nikon D600. For lenses, I used a Nikon 70-200mm f/2.8 VR lens, a Nikon 28-300mm Lens, and a Nikon 14-24mm f/2.8 Lens, plus a tripod. I carried a lot of other gear, too. To get some more Grand Canyon National Park photo ideas, check out my Grand Canyon National Park Photo Gallery. 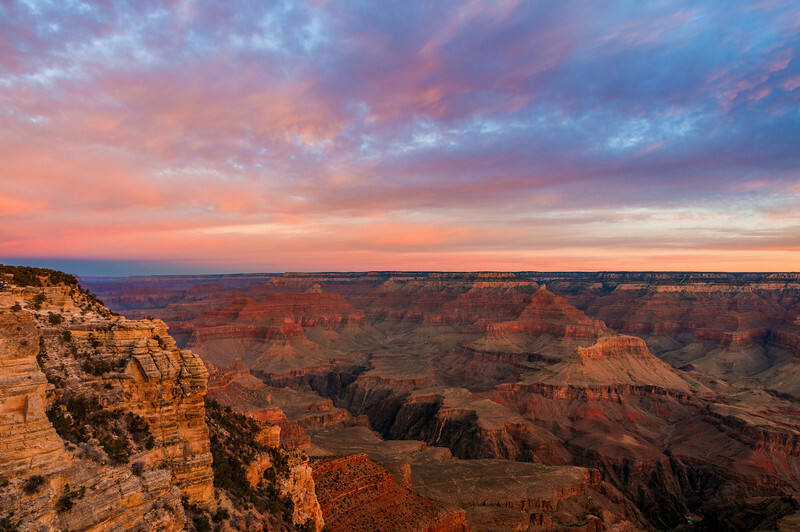 Where are your favorite places and things to do in Grand Canyon National Park? Which of these would you most like to photograph? Any questions? Share any thoughts you have in the comments! We finally visited the Grand Canyon, 4+ years after this post, but I still enjoyed re-reading it in preparation. Aside from El Tovar Dining Room, which probably gets by on location more than cuisine, the recommendations are good. Sunset was blah today, but we’ll try sunrise tomorrow! After visiting here, I understand why you and others like wide-angle photography so much. My 24mm isn’t enough. I’m a huge fan of your photos and the Disney blog, and page through your stuff for inspiration a lot. I read flickr, and I noticed that since you switched to using IFTTT to upload you’ve stopped posting EXIF. Would be nice to see you fix that. Anyway, on to my real question, I’m headed to the Grand Canyon this spring and I can pretty well spot your 8mm/12mm fisheye shots immediately, but I have a harder time with the others. I’m looking for a walk around lens upgrade from my 18-200 3.5/5.6 and thinking about the Tamron 24-70 g2 lens, I really feel like it will cover most of what I want in a standard lens and allow the versatility of short to medium and not distort people like by 11-20 Tokina (which I love) for a family vacation photos type lens. I’m really trying to take more thoughtful photos while not ignoring the family in the frame. Would you prefer this lens over say a 35mm prime for landscape/family photography. Like I said I’ve already got a 11-20 and also a 50mm 1.8. I shoot DX and plan to keep it that way, headed towards a D500. Thinking about biting the bullet and getting an 8mm too, but that gets even further from being able to include people in a flattering way. We did the Grand Canyon last September… hit a lot of these. We did both South and North rim. Totally different worlds. North rim is hard to deal with logistically. We wound up driving from South Rim to Page, AZ, spent the night, got up, drove to North Rim, did the various drives/loops, then back to Page, AZ that night. 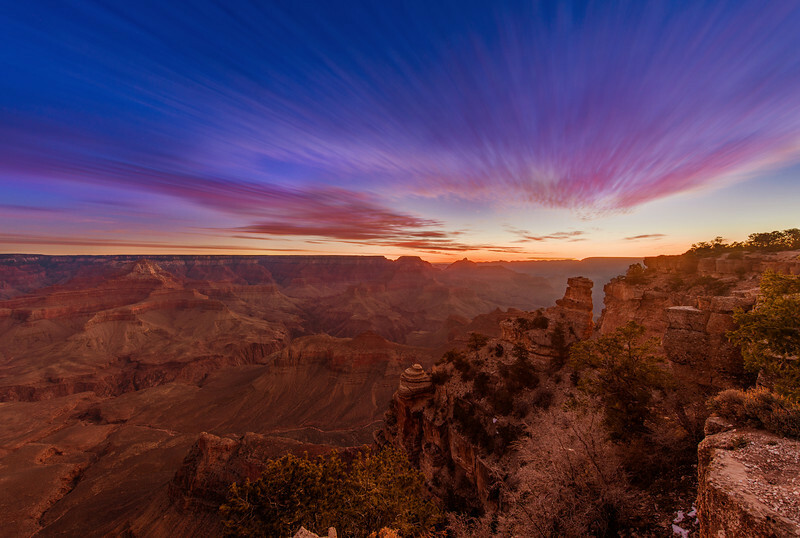 Depends on how much you want to see, you can see a lot in one day on the North Rim. It was rainy and foggy the day we were at the North Rim. Thought it was going to be a washout… a lot of people were leaving after hitting the visitor center. We went ahead and drove the road (why not… we were there anyhow) and it was INCREDIBLE. Practically no-one (I mean we were by ourselves at several overlooks) and the cloud above AND BELOW down in the canyon was beautiful. Totally different look, but totally worth it. Bring a coat though… it was cold (compared to quite hot the day before at the South Rim. Weather can change fast. Thank you for this! I am planning a Grand Canyon National Park trip this fall, so this is fantastic. I can always trust you for good travel advice, Tom! Do you have a favorite National Park, or like top 5 or something? It’s a goal of mine to try and visit more this year! Just got back and found your review. Was sad that I didn’t read it before, until I realized we did just about all of these. What I wanted to say was that if you are camping like we were, it’s great to stay at the two campgrounds right in the park. Also fun to go to the mule barn and take some pics…kind of like the Disney goats! Thanks so much for the great tips! My husband & I are going to the Grand Canyon (south rim) at the beginning of May. We will definitely check out the locations you found to be less busy…we like to avoid crowds! We are also going to the north rim in September…and Yosemite in November. And of course…I LOVE your photos! You inspire us to take better photos…thank you for that too! Thanks for the crowd warning…we are just hoping it won’t be miserably crowded! By the way…if you are ever in Las Vegas, I highly recommend visiting Red Rock Canyon National Park. My husband and I took my parents there this past weekend, and we loved it! It’s really a beautiful place!